The Site Theme tab provides controls for site-wide appearance settings. Access the Colour management and Font management settings using the buttons on the Site Theme tab. Select whether the Header and Footer will span the full width of the browser window (option 1), or whether they will have a maximum width of 1728px (option 2). If option 2 is set, the page background will be visible at the vertical edges of the window, when the window resolution is greater than 1728px wide. 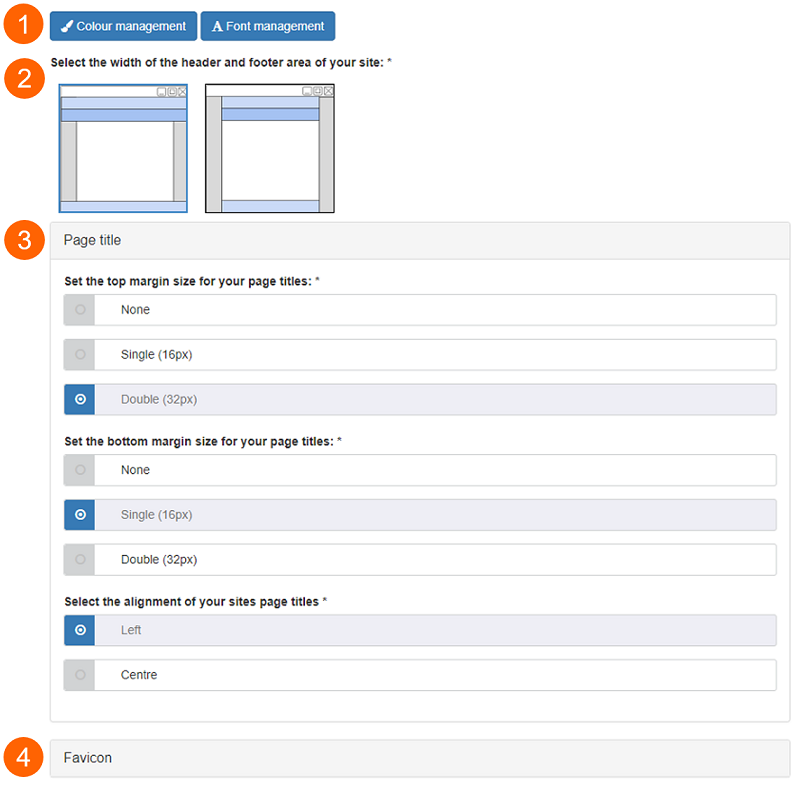 Set the top and bottom margins (amount of space above and below) for the page titles on the site. There are three options: none; single (16px); double (32px). Select whether the page titles on the site appear on the left of the page or in the centre. The favicon is the icon that represents the website in instances such as browser tabs and bookmarks. Use the favicon controls to select a favicon for your site. By default, the Oxford Mosaic favicon is selected; the Univeristy logo is also available as a favicon. Alternatively, upload a custom favicon using the custom favicon option.